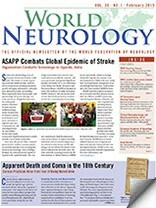 Stroke is the third leading cause of premature death and disability worldwide. The burden of stroke is growing in low and middle-income countries due to many factors including population growth and aging, urbanization, unhealthy diets, physical inactivity and smoking. More importantly, these demographic and epidemiologic factors are driving a rise in the prevalence of high blood pressure, the leading independent risk factor for both ischemic and hemorrhagic stroke. In many less developed countries, particularly in rural areas, awareness of high blood pressure is extremely low and screening services are non-existent. On the other hand, treatment for high blood pressure is widely available and relatively inexpensive. Figures 1. and 2. Dr. Jerome Chin and volunteers at an ASAPP project site in India in November 2014. Since 2010, Dr. Jerome Chin, a neurologist in the U.S., has been volunteering for two months annually as an attending physician on the neurology ward at Mulago Hospital, the national referral hospital of Uganda in the capital Kampala. The neurology ward admits more than 50 acute stroke patients monthly, the majority with severe previously undiagnosed high blood pressure. In October 2011, Dr. Chin founded the Alliance for Stroke Awareness and Prevention Project (ASAPP) in Kampala to reduce the incidence of stroke in Uganda. 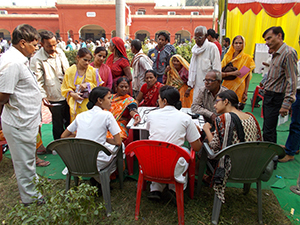 ASAPP volunteers, who are mostly medical and other health professions students, provide free community-based screening and counseling for high blood pressure every week at places of religious worship. Individuals with elevated blood pressures are advised to make dietary and lifestyle changes and are referred for medical treatment if indicated. In December 2012, Dr. Chin visited the neurology ward at the All India Institute of Medical Sciences (AIIMS) in the capital Delhi. Similar to Mulago Hospital in Uganda, the majority of patients admitted to AIIMS with acute stroke have severe previously undiagnosed or untreated high blood pressure. In December 2013, Dr. Chin launched ASAPP in India. ASAPP currently supports six project sites in Uganda and three projects sites in India. In addition, ASAPP is partnering with the Uganda Ministry of Health and other organizations including Rotary International and Impact India Foundation to provide free high blood pressure screening and counseling at special health camps and events. 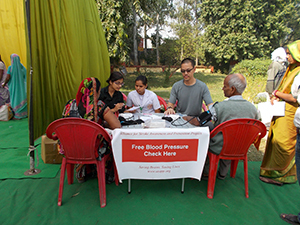 ASAPP project sites have provided more than 55,000 free screenings for high blood pressure since 2011. In the next few years, ASAPP plans to launch additional project sites in Uganda and India and expand to Nepal and other less developed countries. ASAPP is a U.S. tax-exempt non-profit charitable organization. For more information, visit www.asapp.org.